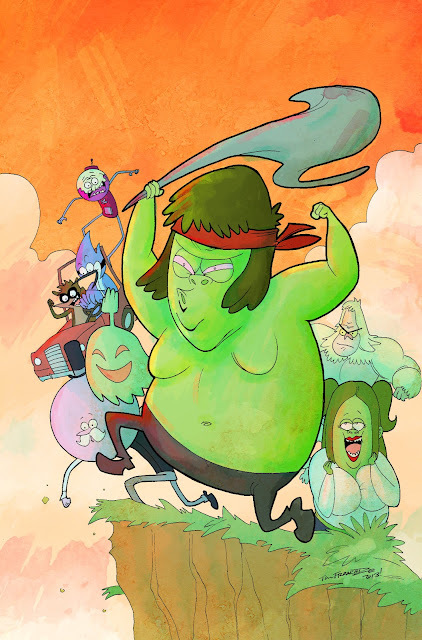 Awesome Con Exclusive cover to Regular Show #1. Line art by Me! Con season is here my friends! I have mentioned before that me and the ID Crew will be popping up at a bunch of shows this year and one that we are really excited about is AWESOME CON. Awesome Con is Washington DC's newest comic convention and it's being held at the Washington Convention Center on April 20th through the 21st. One of the reasons I'm so excited about the show is because The ID Crew and I are guests at the show. We'll be selling some brand new prints and have new mini artbooks for sale as well as the latest issues of Fanboys vs Zombies. Plus I was given the opportunity to do an exclusive Regular Show #1 Cover for the con. Regular Show is a hilarious cartoon and this as of this Spring is a new comic from Boom! Studios. So if you are in the DC Metro area come on and check out the show. See you there!